South Korea's government says it is monitoring reports that North Korea's vice-premier Choe Yong-gon was killed in May on the orders of Kim Jong-un. 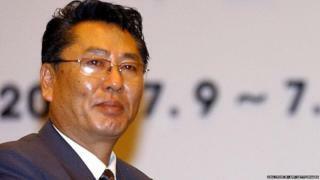 Mr Choe was executed after he "expressed discomfort against the young leader's forestation policy", South Korea's Yonhap news agency reports. Close to 70 officials have been killed under Kim Jong-un's rule, Yonhap says. The BBC has not been able to verify the claims. North Korea rarely confirms the South's reports of executions. Mr Choe was last seen publicly in December, South Korea's unification ministry said. The ministry said it was "closely monitoring the possibility of any changes in Choe's circumstances". Few details about the execution were given by Yonhap, which is often first to report news from North Korea. Choe Yong-gon was deputy minister of construction and building material industries, and had represented North Korea in trade talks in Seoul in the mid-2000s. He was appointed as one of seven vice-premiers in June last year, and his promotion was seen by one analyst as a sign Pyongyang was keen to maintain close ties with the South. In April, South Korea's intelligence agency said Kim Jong-un had ordered the execution of 15 officials in the first four months of the year. Among them was a forestry official who complained about the leader's forestation plan, the agency said at the time, but it is not clear if this man was Choe Yong-gon. In May, the agency said North Korean Defence Minister Hyon Yong-chol was reportedly executed by anti-aircraft fire for apparently showing disloyalty to the leader. The reports of the killing of Choe Yong-gon for disagreeing with Kim Jong-un's forestry policy bring into focus a programme that is closely followed by the leader. The country says it is suffering its worst drought in a century, and that close to a third of rice paddies have dried up. Radio Free Asia says the country launched an intensive "greenification" programme last year, with more power granted to every province's forestry department. And in a speech in February, Kim Jong-un delivered a speech in which he said: "At present, the forests of the country can be said to have reached a crossroads - whether to perish for ever or to be restored." He also criticised officials for seeking to respond to problems caused by flooding, rather than prevent flooding in the first place by planting more trees.